Sony and E-ink Announce Joint Venture – Yay, Another One! Sony and E-ink have been working together since before ereaders were a thing, and now they have announced a new joint venture. E-ink and Sony Semiconductor Solutions Corporation, a wholly-owned subsidiary of Sony Corporation, announced that the two companies have agreed to establish a joint venture ("JV") responsible for planning, designing, developing, manufacturing, selling, distributing and licensing products that utilize electronic paper displays, as well as related applications and the integration platform for system partners. The JV is officially registered in Taiwan and has its Japan subsidiary registered in April. The company operation will be started soon after obtaining required regulatory approvals. E Ink's subsidiaries and Sony Semiconductor Solutions jointly invest approximately 70% of JV shares and are the major shareholders leading the JV's business to success. The remaining shares are subscribed by venture capital companies investing in rising startups. The paid in capital is NTD 420 million (New Taiwan Dollars). JV announcements are usually about as interesting as balance sheets, but this is one that deserves attention. Sony and E-ink have been working together on and off for 14 years, and they keep coming up with something interesting. When they first collaborated in the early aughts, these two companies gave us the 6" E-ink screen size as well as that early ereader, the Sony Librie. Sony and E-ink are literally the reasons why the Kindle has the screen size it does - that's how important their cooperation was. And then after about another decade of work behind the scenes, they gave us the 13.3" screen size and flexible Mobius screen tech. So while at first glance one might think there's little reason for anything more than bland optimism while regurgitating the press release, the history these two companies share have this blogger excited at the possibilities of what they might do next. Nate, you have a typo from repeating the phrase “Sony and E-ink are literally” twice in a row. I have this nasty WP bug that I can’t kill. There’s a story here, but I’m not sure what it is. It suggests that Sony has a long-term commitment to e-ink tech. 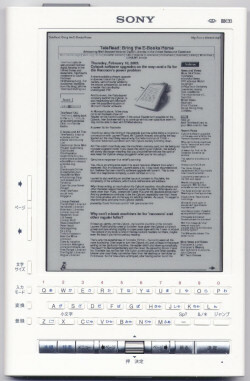 This coincides with its big e-ink pdf reader. Maybe we’ll see another one. In any case, I’m glad Sony is investing in presumably large-screen e-ink.